All I can think of is Tony Stoddard and his son, Cole. All I can think of are the children who have suffered through childhood cancer and all the people who love them. September—Childhood Cancer Awareness Month– is here. Those long days of hard work by childhood cancer advocates all year long are beginning to bear fruit. Last night, New York City gave every one of us who has been sucked into the world of childhood cancer a treasure. You see, we know how hard these children fight, and we have witnessed how they suffer. Our dearest friends are parents who have endured the worst of the worst. How can any of us even imagine our child looking to us, like Cole did, saying they will never grow up to do anything? Seeing 1 World Trade Center, the Helmsley Building, and Times Square light gold for childhood cancer awareness does something inside me I cannot even describe. It makes me cry. The tears are tears of sadness, joy, and hope all tangled together in one big ball. This my friends is the beginning of the end of childhood cancer. Cole, you are doing something VERY big. Your daddy’s love for you shines bright, glittery gold. Dear little boy, you are helping us all to do the right thing. We will not relent. In fact, we will join forces. The capacity to care is the thing which gives life its deepest meaning and significance. Since I live on the opposite side of the country from New York City, my impressions of the city are mainly what I see and what I hear. It’s funny how humans establish pre-conceived ideas and formulate judgments about what we really know nothing about. We notice when things are different than what we are used to. I can still feel the odd stares from people Melinda and I would encounter the further we traveled from California on our Hope Tours. We were a “California Oddity”! Likewise, New York City has its very own identity. Some see it as exciting and others see it as cold-hearted. However any of us have perceived New York City in the past, the recent refusal of the Empire State Building to light gold for pediatric cancer awareness has opened the door for the world population to conclude the entire city is heartless. If we look closer, we see this is far from the truth. New York City establishments care deeply about children with cancer, and they are willing to take action to show it. As childhood cancer advocates choked and gagged on the initial response from the Empire State Building, other New York locations began stepping up to fill the hole. The world famous Coney Island Parachute Jump jumped in, Times Square said they would go gold, 1 World Trade Center and 230 Park Avenue will be lighting gold. 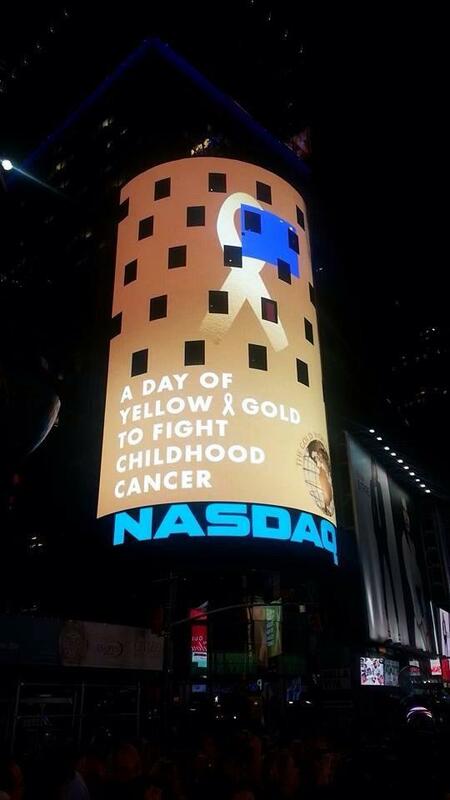 The New York Stock Exchange invited childhood cancer foundation, Frankie’s Mission to ring the bell yesterday! 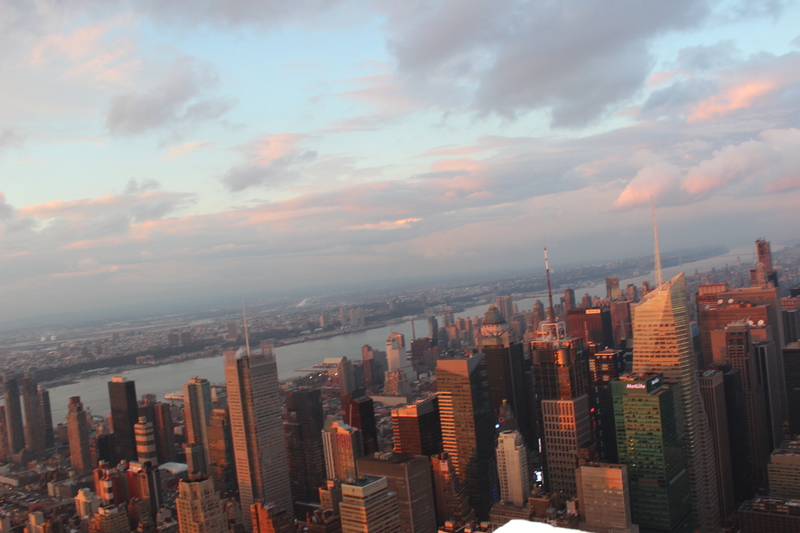 “The fallout or should I say “The GoldOut” from the Empire State Building’s refusal to light gold continues! 230 Park Avenue is the Crown Jewel of Park Avenue and it has joined Times Square in announcing it will be lighting gold in September…” for Childhood Cancer Awareness Month. New York City is going all out for our kids! New York City citizens care deeply about children with cancer, and they are willing to take action to show it. One example of these citizens is a man who happens to be a reporter from Fox 5 New York. This man has done wonders for helping spread awareness for childhood cancer. He has relentlessly sought to educate the public and to enlist the help of people who might assist in influencing decisions that will bring awareness to childhood cancer. His name is Joel Waldman. Please follow him on Twitter and thank him for the generous contributions from his heart. New York City political leaders and major league sports personalities care deeply about children with cancer, and they are willing to take action to show it. New York Giants coach Tom Coughlin spoke with Joel Waldman about a former player of his who died from childhood cancer. In this same interview, Joel speaks with New York Giant Mark Herzlich about his survival from Ewing’s sarcoma and his puzzlement over why the Empire State Building won’t light gold for a night to recognize childhood cancer awareness in September. New York City Councilman Vincent Gentile Deputy Leader (43rd District, Democrat) has also taken action. Speaking with @joelwaldmanFOX5 about my resolution calling on the @EmpireStateBldg to go gold for kids with cancer. One more New York City Councilman and former NYC public school teacher, Mark Treyger, helped influence the decision for the Coney Island Parachute Jump to light gold in September. It looks from my end of the country that just about everyone in New York is stepping up to make this September a year that we will remember in the childhood cancer community as ground-breaking in raising awareness that will lead to research funding and cures. New York, I love you! The lessons you have taught me make me adore you. The Empire State Building has chosen to be a Black Hole, but it is crystal clear that the rest of the city has an enormous capacity to care. Not only do you care, you are willing to take the action steps to show it. Don’t worry, I am not going to let one bad apple ruin it for the rest of the Big Apple. It’s time now to click the Frankie Rings the Bell link again and play it over and over. Is it just me? I swear I hear the sound of children laughing and playing. 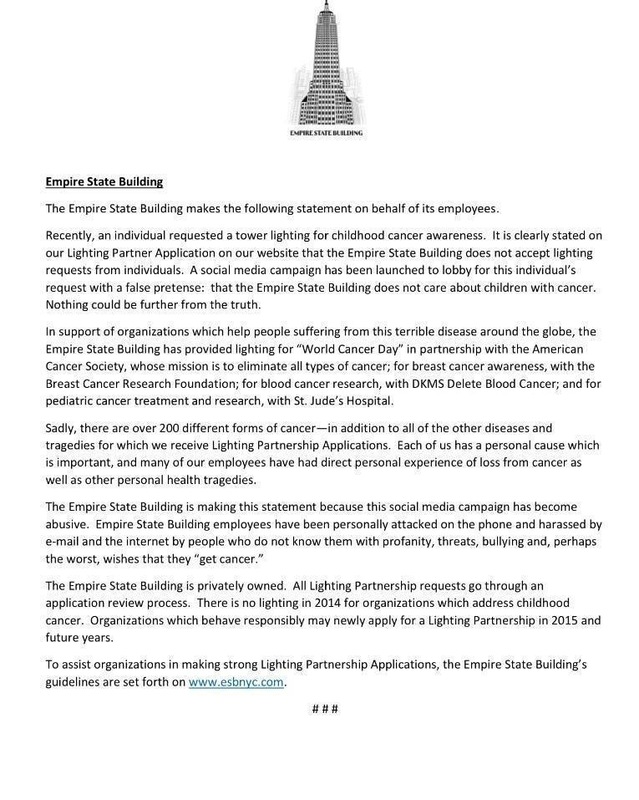 What is missing from your statement is the fact that The Empire State Building not only turned down Tony Stoddard’s request, but refused requests from multiple childhood cancer foundations who all applied “responsibly.” What other conclusion is the childhood cancer community to make—other than the obvious? How can we help but conclude that you simply do not care about children with cancer? You lit The Empire State Building for the release of an Alicia Keys album. Could it be? Could it be that “the wind is blowing in your face” and you can’t “see straight”? Or… could it be that you are simply uneducated about childhood cancer? Could it be that your lack of awareness is the real reason for your refusal? How ironic it is that your lack of awareness is exactly what could be causing the blockade to more awareness! Please, click on this link to learn vital facts about childhood cancer from The Truth 365. Would you now please reconsider your decision? Without a doubt, what would make you change your decision in less than a heartbeat would be for you to actually meet a child fighting cancer. Their utter innocence, their unabashed courage, and their inner strength would melt you. Did you know that current treatments for childhood cancer are equivalent to torture? Did you know that while these children battle for their lives, they are always thinking of others around them and how they are feeling? Have you ever seen the face of a child who looks to you for hope? You have the ability to bring joy and happiness to these suffering children. 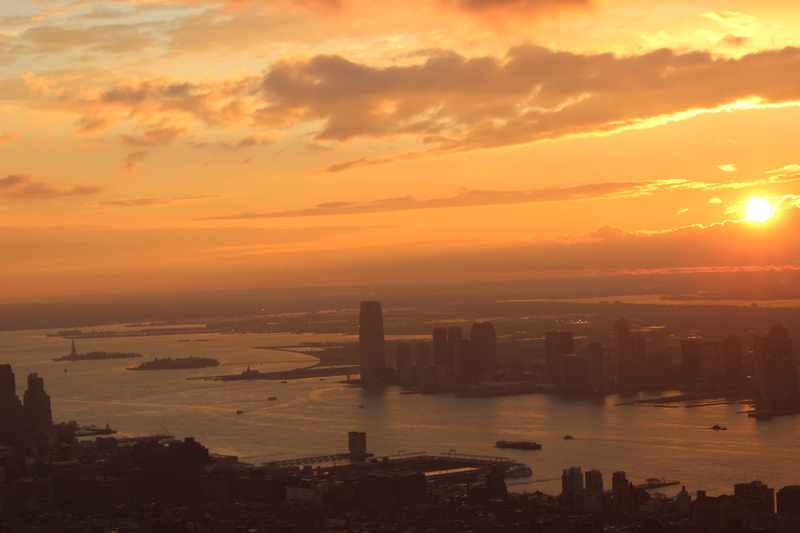 You have the ability to shine a light of hope over New York City and our country. 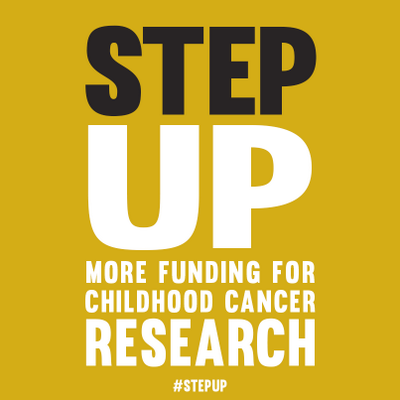 You have the opportunity to save children’s lives through awareness that leads to research funding. Imagine—you could be like Santy Claus when these kids see that the Empire State Building has given them a brilliant, shiny, gold gift of hope. You could be a shimmering mirror that reflects the beautiful light that shines inside of these kids. 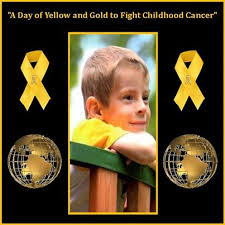 As other New York establishments announce that they will be lighting gold for pediatric cancer awareness month in September, like the Helmsley Building, Times Square, Coney Island Parachute Jump, and 1 World Trade Center, I ask you to do the same. A change in your decision will not mean you are weak and crumbling under pressure; it will mean you are strong and growing.